25 Years of Beautiful, British, Handcrafted Metalwork. 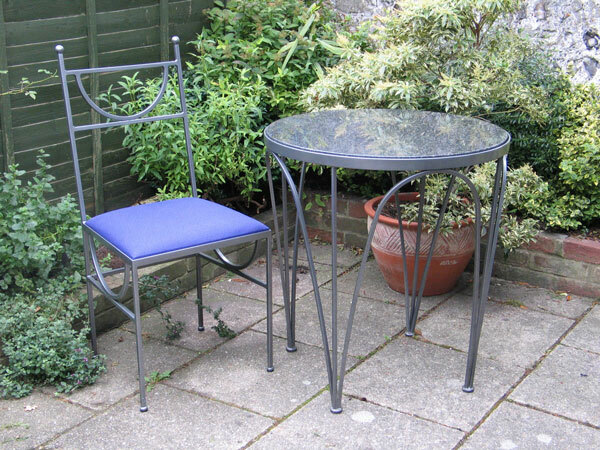 Our metal furniture can be enjoyed outdoors as well as in the dining room or the conservatory. We can also make metal bench seats with or without commemorative plaques. All mild steel furniture can be made suitable for the garden by pre-treating with hot zinc spray for long lasting protection from the elements. We would also use suitable upholstery materials. As well as tables and seating for outdoors, we specialise in trellises, pergolas and other ornate garden structures. 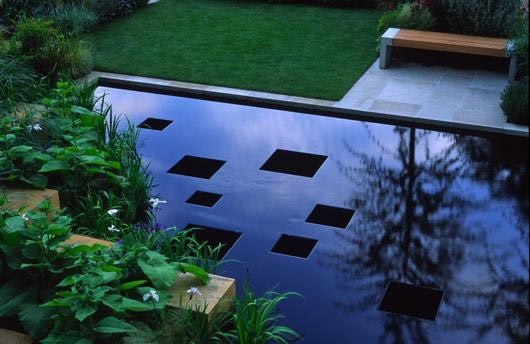 For the 2005 RHS Chelsea Flower Show we were commissioned to work on two prestigious gold winning gardens: The Merrill Lynch Show Garden created by Andy Sturgeon; and the Best Chic Garden 'The Gallery Outside' by Phillip Nixon & Marcus Barnett. 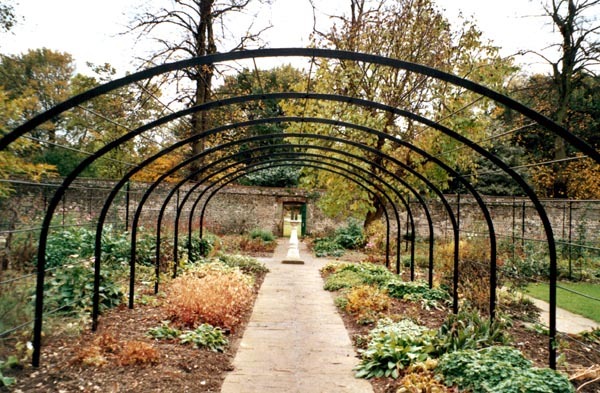 Another commission was a pergola and rose trellises for the walled garden at Preston Manor in Brighton. 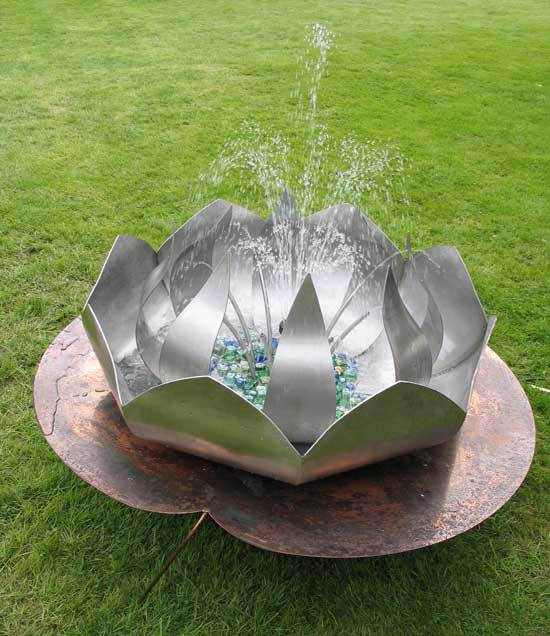 PMF revealed a stunning Lotus Flower Water Feature at a show held at Pashley Manor Gardens in Sussex. 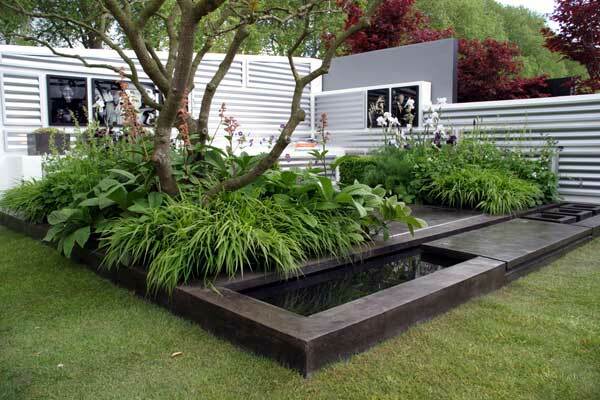 The water feature can be a stand alone water feature, ideal for roof gardens and terraces, or can be incorporated into a pond. Please contact us for full details. The garden sculpture below was created to a brief for The Alternative Feng Shui Garden at the Hampton Court Palace Garden Show 2005. PMF also created the Tahlia Table and Chairs for the garden. "PMF Metalwork provide the ideal balance of creativity and engineering expertise for our out-of-the ordinary projects." "We contacted PMF about a bespoke bed design... Matt and Polly were really great, taking rough drawings and turning them into a fantastic bed frame, the finish of the steel is really impressive. Great communication, fast turnaround and quality workmanship. Many thanks." "Please accept our thanks for all your hard work and for putting in so many extra hours to get our panels done in time and with faultless quality. 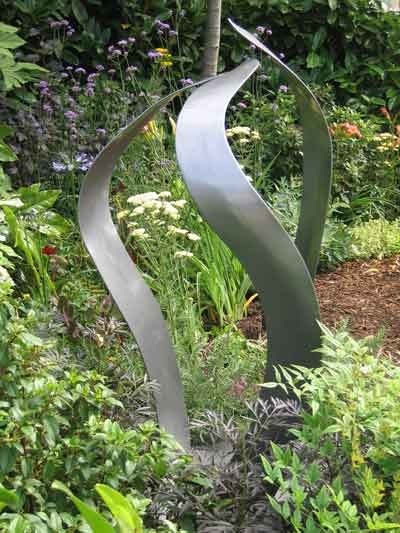 The garden looked fantastic and as you know we came away with a gold medal, which is in no small part due to the quality of the metalwork you did for us."